This page refers to the housing development encompassed by Cumberland Drive, Lord Street, Chancery Lane and High Street. 23 March 2016: the ugly fencing around the site has now been ‘wallpapered’ with marketing information and illustrations of the new properties. February 2016: Developers have moved onto the site. It has been fenced with solid (ugly) boarding. Pile driving has been taking place to provide a firm foundation for the buildings to be constructed upon. 2013: The Red Lion has been closed and sold to be converted to a domestic house. 20th February 2012: We understand that the total area of land, both the top site and the bottom site, have been sold on to another developer. We also note that the Red Lion Inn is up for sale, although it has a To Let sign on the building. The pub’s lease on the car park lasts, apparently, until the end of 2012. If you would like to read the inspector’s report it’s here. May I thank everyone who has supported our case, which is no less worthy for having been lost. All those who attended meetings, distributed leaflets, wrote letters of support for our case, and attended days of appeal meetings at Macclesfield Town Hall – to all of you I offer my most sincere thanks. Many lessons have been learnt from this lengthy process but the most important seems to me to be the necessity of preparing a very detailed case immediately an objectionable application has been submitted and to ensure from the outset that the CEC planners are on our side. I believe that one of the main reasons we lost this case was because the planners were recommending acceptance of the proposal and then having to face the other way after the planning committee rejected the application. 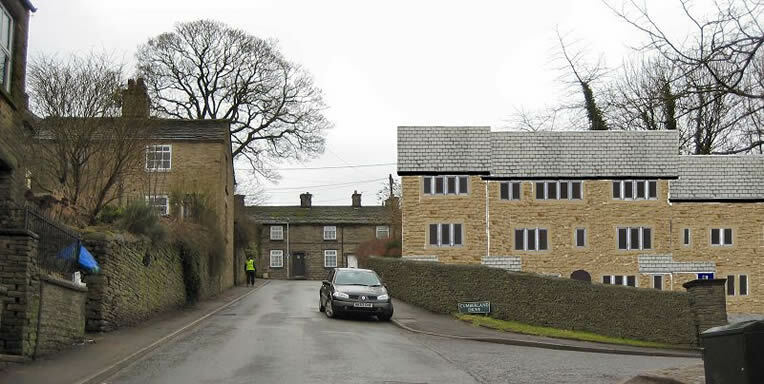 The planning application for the upper site, the land immediately opposite the Red Lion Inn, has been approved by the planning dept at Macclesfield without putting it before the planning committee. The application can be seen on Cheshire East Council’s web site. Click here and enter application no. 10/2108M. Messrs Cumberbirch instructed their agent, Mr Copestake, to meet Tim Boddington and Chris de Wet to discuss in more detail the community’s concerns regarding both the lower and the upper development sites. Messrs Cumberbirch do seem to have heard our concerns regarding the upper site and sent draft plans showing their thinking. In these they answered most of our criticisms, although they will still remove the public parking facility presently enjoyed by the pub and the community. They have answered all our criticisms of the original proposal other than our desire for some public parking space, particularly for the pub. The latter wish could not be used to overturn a planning application. We believe this plan provides the most achievable compromise that we are likely to get. The appeal made by Messrs H Cumberbirch & Sons Ltd. against Macclesfield Borough Council’s refusal to give planning permission to build on the land at the top of High Street/ Lord Street/ Chancery Lane/ Cumberland Drive was dismissed by the Inspector after considering the evidence given at a three day inquiry held in Macclesfield Town Hall during August and September. Obviously, we were very pleased with this result. It demonstrated the value and importance of a well developed opposition case to such proposals which always require strong community support over an extended period of time. We got this in spades and I thank the community very much indeed for this tremendous support. In particular I thank Chris de Wet who single-mindedly gathered the community into a cohesive and effective opposition.